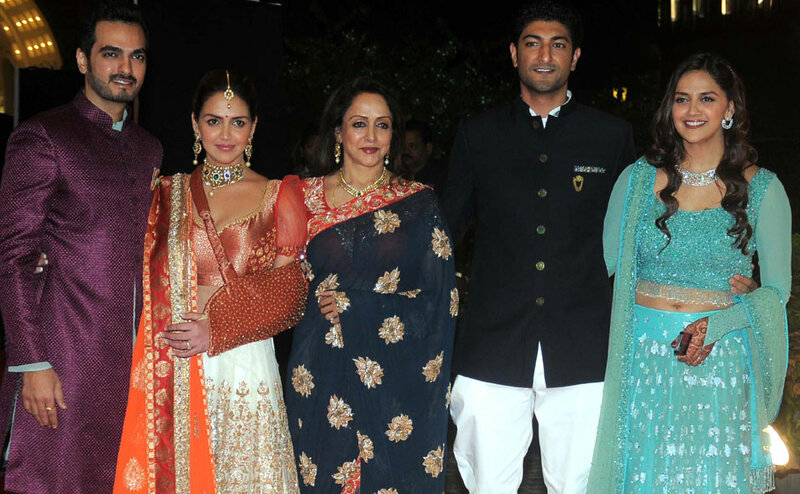 I don’t think we can call Ahana a celebrity but well she is daughter of Hema Malini and Dharmendra so her wedding was a star studded affair. I awaited this wedding eagerly because the fabulous ethnic wear you get to see in Big fat Indian wedding is a treat to eyes, also Esha deols wedding was a grand affair and I wanted to see what Ahana will wear. But I was pretty disappointed With Ahanas choice of clothes especially for sangeet and Reception , she could have done so much better. Lets have a look at what she wore for the different wedding ceremonies. I loved what Ahana wore for Mehendi, the dark blue lehenga with green choli and that floral tiara was a great idea simply because it is very different from the floral jewellery thing everyone is opting for mehendi these days. Hema Malini looked great in Silk saree and floral jewellery while Esha wore something similar to Ahana . I think that blue dupatta was not a great choice by Esha , she almost matched her sister . Esha could have atleast tried a different drape and let Ahana steal the limelight. For Sangeet Ahana opted for a blue lehenga and she looked lovely in it. I like how Esha went for a totally different colour and dint match the bride in this ceremony. Hema Malini looked as elegant as ever . There aren't many pictures of the pheras (private affair?) But in the available pictures Ahana looks lovely. Another Monochrome look is what Ahana did for Reception (after Sangeet). A floor length anarkali from Manish Malhotra which looked good on Ahana but it was not the best. This look would be good for the brides sister or for a guest not for a bride. Ahana cold have added more colour to her look atleast via her jewellery. Here is what Aahana had wore at her engagement months back. Not a fan of her look here. Of all her looks I liked Ahana’s Mehendi ensemble the best. I like how the Mehendi Lehenga has horizontal bands on it instead of the traditional vertical flare. Edit: oops Ahana had a mumbai reception too for which Ahana kept it simple Again as she wore a pastel green gown. Doesn’t this give you a cindrella feel?